If you are planning a trip to Lebanon, this travel guide will offer you more information than you need from attractions in Lebanon to shopping and the cuisine. The shining star of the Middle East, Lebanon has been dressing its wounds of civil war since the 90s and gaining its old reputation back. In this matchless country, three religions and many different cultures are intertwined. The people are broad-minded, contrary to what is believed and all of them can speak fluent French, English and of course Arabic. This beautiful Mediterranean country offers you a warm, scenic, historic and enjoyable atmosphere. You both enjoy a summer holiday or ski on the mountains. If you are after history, there are so many landmarks in the country that will appeal to you like more than 2900-years-old Phoenicia ruins. Is natural beauties your interest? Then head to Jeitta Grotto. Are you a nightbird? Beirut offers you the most amazing nightlife ever. The legendarily delicious cuisine of Lebanon is also awaiting to be discovered. You may have been tasted these popular Lebanese dishes anywhere in the world but know that they can never taste as good as they do in their home country. If you are ready to explore this gem in the Middle East, let’s take this journey with us to Lebanon. Lebanon is in the Middle East bordered by Syria in the north and the east and Israel in the south. If you hold a passport that has a entry or exit stamp for Israel, you will be denied. However, if you are a resident of the following countries, you can stay in Lebanon up to 6 months. If you are from another country, please visit the official website of Ministry of Foreign Affairs and Emigrants to have more detailed information about the visa requirements. 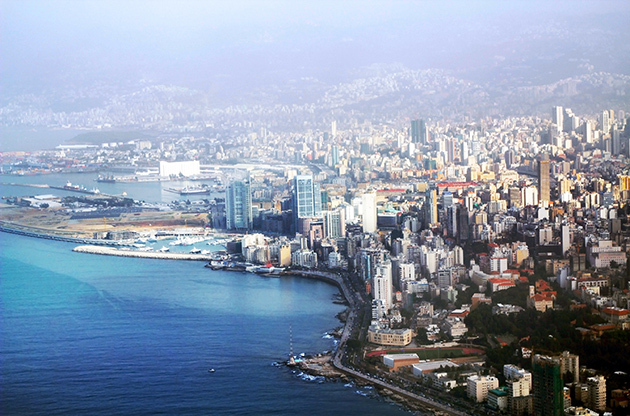 Undoubtedly, Beirut is the ultimate place that you should pay a visit to during your Lebanon trip. Amazing nightlife, beautiful beaches and a breath-taking coastline, natural beauties, history and many remarkable restaurants where you can taste from the famous Lebanese cuisine are all in the capital city, Beirut. Located 20 km away from Beirut, Jeitta Grotto Caves spans 9 kilometers and is formed of 2 different caves. These two karstic limestone caves (upper and lower one) are interconnected and you can travel between them by the cable car. The world’s largest known stalactite is also located there. This magnificent natural beauty was the candidate for the New 7 Wonders of the World. Beit ed-Din is a gorgeous palace from 19th century. It is located only 40 km away from Beirut and it is a perfect example of Lebanese architecture. Deir el-Qamar, a Maronite village, means Monastery of the Moon and it is a UNESCO World Heritage Site. You can visit the beautiful palaces in this area during your visit to Beit ed-Din because you can walk from one to another. If skiing is among your favorite activities, Faraya will be your favorite place in Lebanon. Located around a 40 minute drive from Beirut, Faraya offers you the opportunity to swim and ski on the same day. If skiing is not enough for you, you can choose to see the ruins of a Phoenician temple and a Roman tower in Faqra (a village near to Faraya). If you go to Faqra, you’ll also have the opportunity to see the natural bridge that is formed by wind and water erosion. Known as the oldest continuously inhabited city in the world, Byblos is under the protection of UNESCO. This Phoenician city is a center of attention among the tourists thanks to its famous fish restaurants, its ancient port, the ruins and the picturesque beaches. Baalbek is an ancient city that has 3 temples that are called Jupiter, Bacchus and Venus. Jupiter is the largest one and the Bacchus is the best preserved ancient temple in the world. Although it is bigger than the Parthenon temple, it is not as famous as it is. Lebanese Cuisine is actually a topic of another article because this legendarily delicious cuisine can be a reason to visit Lebanon all by itself. You may be familiar to these tastes because they are so popular that you can find them anywhere in the world but never dare to leave Lebanon without tasting these great bites in the homeland. Take this list with you and enjoy the most amazing taste journey ever. However, remember that these are only the small part of must taste Lebanese tastes. Maamoul can be found in many different variations. Generally, it is type of a cookie that is made from semolina and filled with date or walnut. One of the most popular dish in Lebanese cuisine, Hummus is made of mashed chickpeas, lemon juicie, tahini and garlic. Spread this dip on the pita bread and enjoy. Thanks to being a Mediterranean country, Lebanese cuisine has easily digestible and light food, generally. And Fattoush is one of them. It is kind of a salad that is made of toasted pita bread, vegetables and mixed greens. Another great bite from Lebanese cuisine is Fatteh. The fried pita breads are the base and boiled chickpeas are scattered over it. Then it is covered by garlic yoghurt and red pepper flakes are sprinkled on it. Another best friend of the pita bread, labneh is strained yoghurt garnished with olive oil and some spices. A type of burghul rice cooked with lentils and onions. Arak is a popular alcoholic drink that is anise-flavored just like Turkish raki but the alcohol by volume is generally higher. Tabbouleh is a salad that is made of burghul, tomato and diced parsley. Lahmbilajin is kind of a pastry that is covered by minced meat, onions and nuts. Za'atar is an irreplaceable member of the breakfasts for Lebanese people. This spice mix mainly contains sesame, dried thyme and sumac and it is consumed with extra-virgin olive oil. The fantastic tastes of Lebanon will definitely make the perfect gift for your friends and family. However local products or handicrafts are the other options. Let’s take a look at what to buy from Lebanon. Lebanon is the one of the most attractive spots in the Middle East. So it is generally preferred as the home country for many reputable international events in the region. There are many large-scale event venues that meet the international standards and each year, millions of people from anywhere in the world come to Lebanon to attend these respectable conferences, congresses, symposiums and trade fairs.